I'm opening my 'Studio' as part of Art on the Map this weekend (11/12 October). I wish I could have been there to see it displayed in all its Glory. What a feather in the cap for all who participated....tell me how are you going to top it!!!!!!!!!!!!! Proceeds to Church and Village Hall. 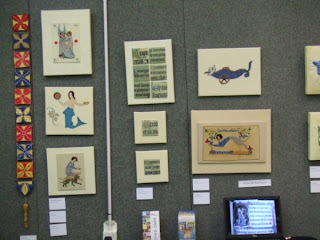 It took six hours to put up the exhibition, but we were very pleased with the way it looked. 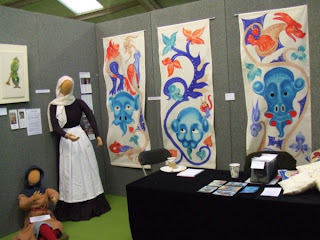 We had one of the largest stands at the Show. I never expected the reaction we got - the visitors absolutely loved it. So many people said it was the best they'd seen all day. The letters created a lot of interest and many people thought they were stitched on leather - luckily we had a little sample with us so we could explain the technique to people. Beaky was very popular (and is thinking of setting up his own fan club). I'm sure he had a run round overnight. He does look evil doesn't he. 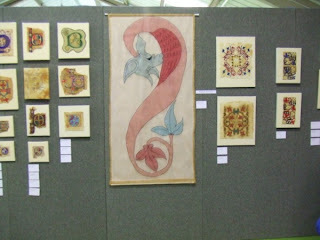 The 16 foot banners we had at The Collection were split up so we could include them in the exhibition. The vessels looked good and provided another dimension. 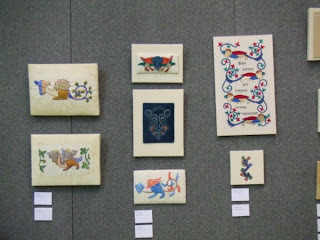 People were very interested in our work with HMP Morton Hall and were very impressed with the standard of the work. 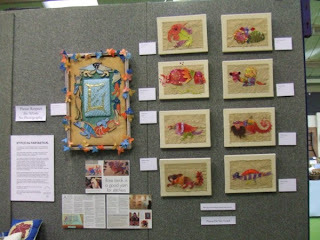 The Young Embroiderers work also attracted a lot of attention and the visitors loved the colours and the cheekiness of the work. WAG Screen loaned us some of the costumes from their film, but we had to leave the ploughman behind as we ran out of space. I'm sure we got some funny looks driving up the A1 with the bodies in the back of the car! Thank you everyone who made work for the exhibition, Mavis for lending us her copy of The Psalter, to Heather for her help setting up and stewarding and to Jackie, Annette and Mary for stewarding. It's been great fun. 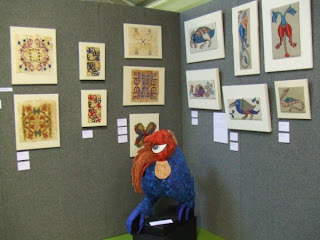 We've packed everything up from The Collection now and everything's ready to go to Harrogate tomorrow. 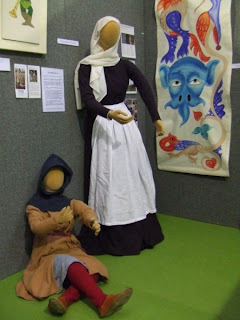 We'll have all the Luttrell Psalter work (and more) from the Stitch the Fantastical exhibition and some of the costumes will be there too. There are still some places left for the Goldwork Guild meeting on Sunday 8th June, at Sudbrooke Village Hall, starting at 2:00 pm. People are asked to come with basic sewing kit, and a piece of goldwork they have worked..... if they have one. 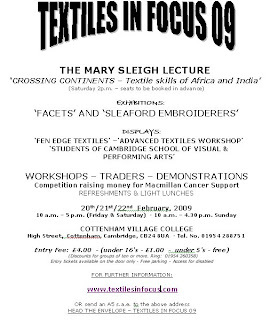 Opportunity to purchase goldwork supplies. Runs from 2:00 pm - 5:00 pm. 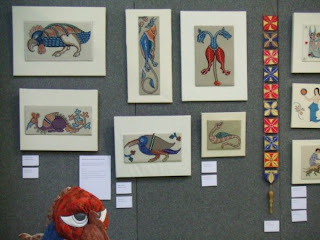 Stitch the Fantastical - Luttrell Psalter exhibition. On Friday evening I went to the opening of the above exhibition. 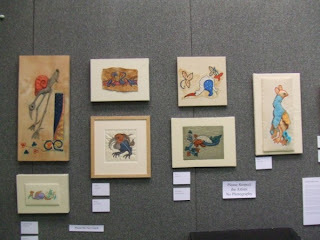 The work presented by theEmbroiders Guild members is absolutely fantastic. 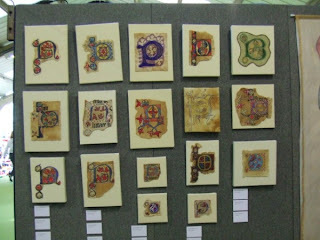 Attention to detail ,using lots of interesting techniques , bring the pages of the Psalter to life. 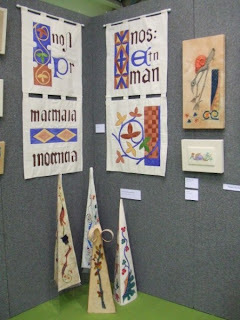 So much hard work and dedication to the project by Lincoln Bailgate members, the Young Embroiders and Fine cell has certainly paid off and compliments the film'The Luttrell Psalter. 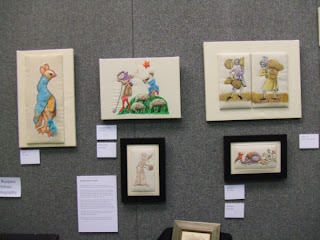 Susan Lenz is organising an exhibition and wants to include atc's and postcards from anyone and everywhere. 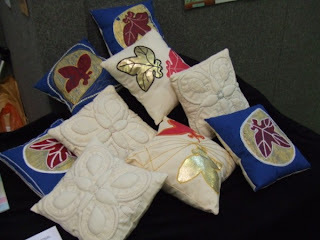 Susan has made over one hundred of each and is offering one of hers in exchange for one of yours. It is easy to take part, just go to the blog read her instructions. It is a fantastic offer to chose the one you want to receive. We will be using the gardens at Doddington Hall as inspiration for some new work. The aim of the day is to provide inspiration for you to produce some work on the theme of ‘gardens’ to go towards an exhibition in 2009. Please note that Doddington Hall is not open to the public on the day and access to the house is NOT included. Afternoon - on your own, gathering ideas and inspiration in the garden - drawing, photos, etc. Help will be available if you need it. We will have access to a shelter in the Kitchen Garden, which has tables and chairs. It will be advisable to wrap up warm! There are six acres of gardens including the walled kitchen garden and knot gardens. When we visit the snowdrops should be at their best. You will be able to purchase a season ticket for the gardens for £10 instead of the usual price of £15, this will allow you as many visits as you wish through the year. 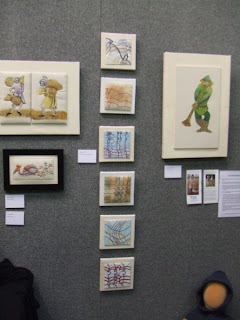 There's a couple of exhibitions at Trentham Gardens, Stoke on Trent, that you might be interested in.